Three plants from Southern Living Plant Collection were recently honored with the FlameProof award from the Dallas Arboretum Plant Trials. Each year, the Dallas Arboretum Plant Trials program tests thousands of plant varieties in search of those that thrive in the scorching heat of a Texas summer. Only those plants that score exceptionally high under the extreme conditions are awarded the FlameProof designation. 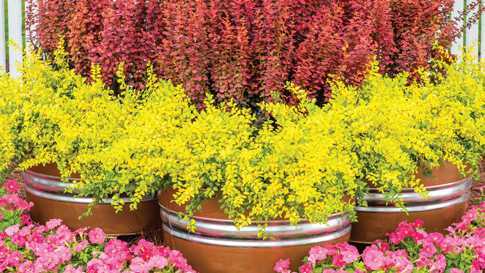 This year, Southern Living Plant Collection’s ‘Sunshine’ Ligustrum, ‘Mood Ring’ Podocarpus, and ‘Lemon Lime’ Nandina received the coveted FlameProof award. With evergreen foliage, these three heat-loving shrubs not only flourish through hot tropical summers, but look good all year long. Extending that heat tolerance to the dry Texas climate is no small feat, where temperatures commonly soar above 100°F in summer and rain patterns swing between drought and torrential rains. Plants in the trial gardens receive care similar to what a homeowner might provide, including overhead irrigation about twice per week. “The FlameProof award is testament to the rigorous selection process we put our collection through,” McConnell says. The Southern Living Plant Collection is comprised of innovative plants selected for their ability to solve specific landscape challenges. In addition to heat tolerance, plants are evaluated for hardiness, pest resistance, and improved ornamental characteristics. For example, ‘Sunshine’ Ligustrum offers distinctive golden hues and tackles a number of traditional privet problems. This non-flowering cultivar is sterile and compact, making it non-invasive and allergen-free. The other FlameProof award winners offer similar improvements over traditional varieties. ‘Lemon Lime’ Nandina stands apart for its compact size and lush, chartreuse foliage that brightens landscapes. With deer and drought resistance, ‘Mood Ring’ Podocarpus provides a low-maintenance mainstay for privacy screens and hedges. Attractive bronzy-pink new growth and a more manageable size offer a modern twist on this Southern classic.